By Jake Rocheleau in Web Design. Updated on November 22, 2017 . There are millions of open source projects online with new ones being launched every day. Developers from all backgrounds flock to open source because it’s the best way to scale a new project by crowdsourcing bug reports and code solutions. Yet, with millions of projects how do you wade through the noise? Libraries.io is the solution. 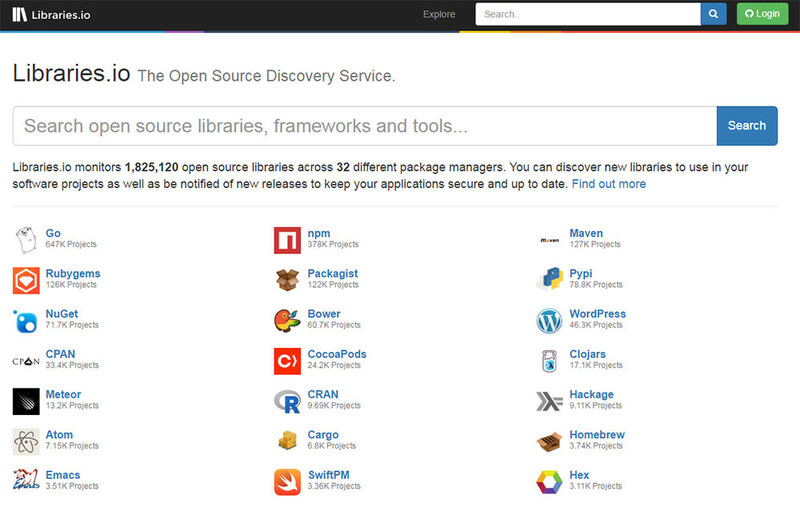 It’s a free online search repository that pulls results from 1.8 million open source projects and counting. Libraries.io connects into the most popular package managers like npm, bower, Packagist, and WordPress’ growing inventory of plugins. Projects can be sorted by a particular package manager, by a programming language, by the open source license or by certain keywords. 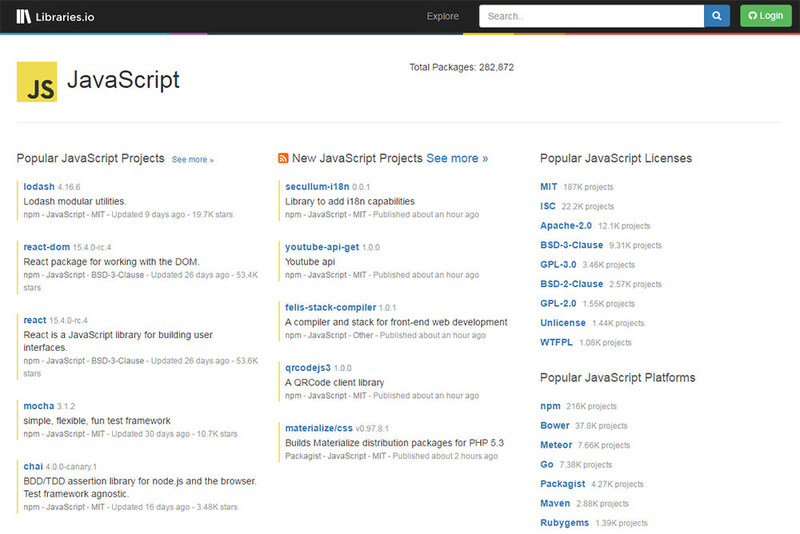 You can even combine the two and search for JS packages that are under the MIT license. The possibilities are practically endless. You’ll find lists of the most recent and most popular packages at any given time on the explore page. A lot of stats are also pulled from GitHub so the most popular libraries rank by the number of stars and contributors on GitHub. This can be a good thing if you’re looking for the coolest new frameworks and libraries to play with. GitHub is notorious for having a very so-so search engine. It’s not bad. However I think Libraries.io is a whole lot easier to use. Each project page has links to the GitHub repo and to the official website. You can search for anything from Ajax libraries to WordPress caching plugins and find tons of great resources. Once you find something you like you can check out the library page for more details. This lets you subscribe to new updates via GitHub and gives you a historic view from the project’s inception to the current version. If you’re a developer you can also pull data straight from the Libraries API. You connect into the site with a GitHub account, get your API key, and then you can build your own webapp powered by the Libraries.io engine. This really is the #1 open source search engine for programmers and web developers looking for the coolest new projects. If you’re always on the lookout for new plugins and frameworks then Libraries.io will prove to be an invaluable resource.